I've been struggling to find my Christmas spirit this year. Our December weekends are so full that we had to write "buy Christmas tree" on our calendar, and our initial weekend plan doesn't have me doing any Christmas baking until Dec. 24th. We still haven't figured out when we'll take the girls out to see the Christmas lights in our neighborhood. To be honest, the season has felt more like a forced march through a list of things I have to do than like a celebration of peace, love, and all that. Yesterday, as our calendar dictated, Hubby went out and bought our Christmas tree. He came home with a tree that seemed far too big to me. We had to rearrange our entire living room to find it a place to stand, and even so, the only place it fits is right next to our front door. This is our first year with a full size tree- previous years, we have bought a small tree and perched it on top of an up-ended trunk full of books. We figured this would keep curious little hands from breaking any ornaments or pulling the tree over. 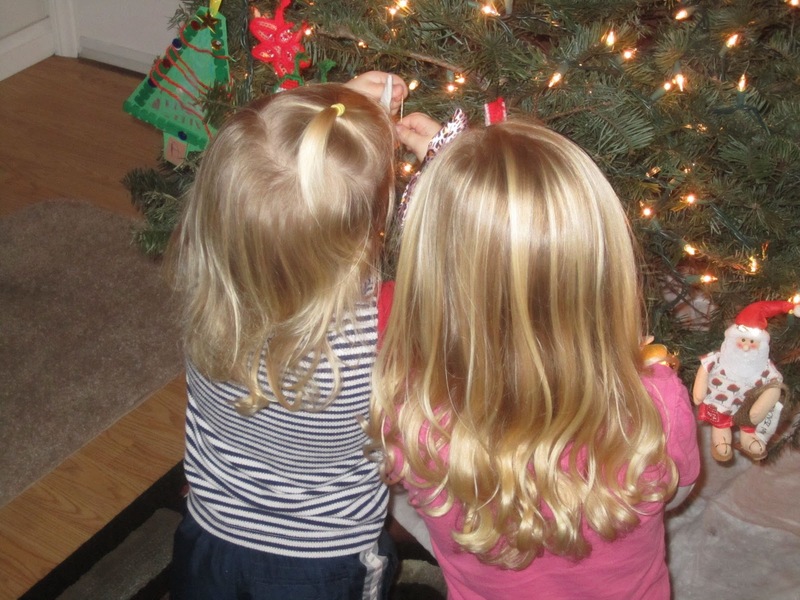 But this year, we decided that the girls are big enough to handle a big tree. So a big tree we have. It is so much bigger than previous years' trees that I had to go out and buy more lights for it. I bought a light up star for the top, too, in an attempt to buy myself a little Christmas spirit. That attempt failed, but tonight we decorated our tree, and a little bit of magic happened. It started out poorly, with the girls chasing each other around the house giggling, and us almost yelling to get them to listen to us and calm down enough to start decorating. But then, they started hanging ornaments on the tree, and it was wonderful. Pumpkin pronounced every ornament she picked up to be "beautiful" and was eager to help her little sister figure out the ornament hanging thing- maybe a little too eager, but Petunia didn't complain, so neither did we. Petunia kept saying "I help" as she went between the table with the ornaments and the tree. 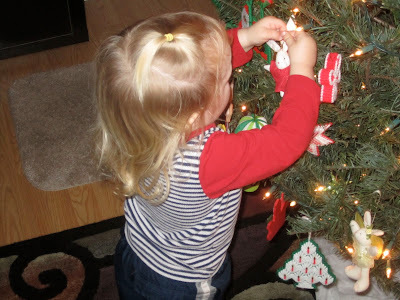 She was so proud of herself every time she managed to hang an ornament that we didn't have the heart to tell her that the ornaments were meant to hang on tree branches, not light bulbs, and just surreptitiously moved them to safer locations nearby when her back was turned. My sister had come to help us decorate, and brought a box of cheap but festive ornaments from Target to fill in the inevitable gaps caused by going from a 4 foot tree to a 7 foot one. The girls let us lift them up from time to time to put ornaments higher on the tree, but there is a definite local minimum for ornaments in the front and at the bottom, giving the tree a charmingly uneven look. But I think it is beautiful. I'm sitting on the (rearranged) sofa typing this, enjoying the view of the tree and some newly discovered Christmas spirit. The only thing missing is a good Christmas cookie- the ones I bought turned out to be pretty dreadful. I think that if I go ahead and bake this weekend, even if there isn't really time, my Christmas spirit may turn out to be intact this year, after all. How about you? How's your holiday spirit this year? What makes it feel like the holidays at your house? The giveaway on the Secret Agent Jo post is still open. I'll pick the winner Saturday night, maybe over some nice Christmas cookies. My Christmas spirit started out ok, but has been awol for the last couple of weeks. We had a really fun weekend the first weekend in December with putting the trees up and I baked our Christmas fruitcake. I went over to my parents and helped put up their massive tree that has 35 years worth of accumulated ornaments - including lots of handmade ones. My family tradition was always that we got to choose one new ornament each year. Now, we all tend to buy for my mother when we travel (she's got some lovely ones from the Met in New York, a museum in Reno & Ireland). I've been trying to get a decent photo of our trees to do a blog post myself. Yes, we have trees. We have a 5ft tree that is "Mummy's tree" and a little 2ft wooden cut out tree that is "Moo's tree". She has a few ornaments and a bunch of tinsel and can decorate and re-decorate her tree as much as she likes. This seems to work in terms of keeping her away from our tree. In terms of Christmas lights, we're lucky because our next door neighbours have liberally bedecked their house with coloured and flashing lights so we've only had to walk out the front gate to show Moo some lights. I'd like to take her out to see another house nearby that is fully done out with lights in the shape of reindeers etc- but I'm not sure she'd be much more impressed. I also want to go to the Christmas Carols at twilight in the park down the road this Saturday evening. Christmas cookie baking in our house is slated for the 24th too - because it's when my sister arrives and she doesn't want to miss out on the fun. I'll probably do the dough in the morning with my mother and some family friends before she flies in so we can all just do icing in the afternoon. I always find the tree decorating to be when the Christmas spirit hits me. It's so nice to have something so beautiful in the house! Every morning when we turn the lights on, Evan gets really excited, staring and pointing at the tree. He hasn't figured out that the ornaments come off yet (he wasn't awake when we decorated, which might have been a good thing). I think my Christmas spirit is missing this year. I was totally shocked last weekend when we borrowed a car, turned on the radio, and they were playing Christmas music! I guess I don't listen to the radio much, and we've just been scrambling to keep up with life, much less decorate. At the same time, I have been baking cookies in the evenings - one night you mix up the dough, next night you get small people to help you roll them into cookies and bake them, then into the freezer they go to wait until Christmas (or until I raid the freezer for snacks at night after everyone has gone to bed). I'm not even considering a tree this year, because we won't be here, but I think my husband has plans to decorate our little 4 foot tall ficus tree instead. We had to re-arrange our entire living room to get the tree centered in front of the picture window. Oh sure, I could have put it somewhere else with much less rearranging, but the tree MUST BE CENTERED IN THE WINDOW. It's like the law. I had no spirit, but it's returning. I bought some pre-made dough from a sale at Chuckles's school and I will be baking that (and some homemade as well). I feel so bad about the pre-made dough but I'll get over it. I will. I feel like I've been waiting for Christmas since Halloween, maybe because this is the first one BabyT will really notice. I am focusing on getting the things done to "good enough" rather than obsessing so I can sit back and enjoy. So I didn't rebake the sugar cookies that turned out sort of wonky-looking, I made simpler calendars for the grandparents (one great pic per page rather than a collage of everything we did through the year) and I finished the cards and gift shopping early and really abbreviated our list for both. And made a conscious decision NOT to take custom orders in my Etsy shop, which usually keeps me crazy busy at this time of year. T's college fund is a little sad about that, but oh well, I have a real job that can take care of that without as much stress :). I find that I can enjoy the season much more when I'm NOT running around like a chicken. Incidentally, my word verification is 'murgi' which is chicken in Hindi ;) Appropriate. Um, I meant to say "getting rid of my plastic trees". T would have liked to have her own. Sad. And, we just put up our same fake tree, and it still looks nice. Full of Christmas spirit here. It's our first year in our new house which we hope will be our family's 'forever' home so major incentive to start creating the kind of memories we want our kids to have. And we now live on one of those cul-de-sacs where everyone put up their decorations on Dec. 1 (and there are some people here who take their outdoor decorations VERY seriously). So, it has been very easy to get in the mood this year, and we are having lots of fun. "To be honest, the season has felt more like a forced march through a list of things I have to do than like a celebration of peace, love, and all that. " Amen, sister! Your tree looks lovely. Oh, God, everyone in my household has been ill with some pestilence that takes everyone in its path down. I was the sickest I've ever been. PLUS I'm not done grading. Plus it's our first year having Christmas at our house so we don't have any traditions yet and can't get our act together to get a tree. And I forgot my Advent calendar at my parents'. So it feels like the complete absence of Christmas here. Hopefully by the end of the week, every one will be well, grades will be in, the tree will be bought, and there will be more holiday cheer going around. Oh dear (on the forced march bit). 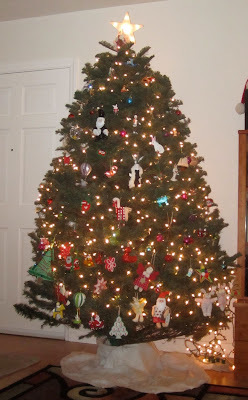 Your tree looks lovely and similar to the one we have, except the ornaments on ours are not only low but in one spot. Well, a noticeable cluster of them. This is making me happy as it of course (like yours) reflects the unique artistic interpretation of our ornament hanger. The tree did it for me, too. We got ours on December 1, which I thought was way too early - but we looked at our calendar and were afraid it wouldn't happen if we didn't do it then. 25 days of sweeping up tree needles and trying to keep my kid from eating the lights or climbing the tree, I thought. Bah humbug. And we got a tree that was way too big for our little house and had to do lots of trimming and rearranging to make it fit. Grumpy. But then, it totally got me into the xmas spirit! I love turning on the lights in the morning or having a glass of wine on the couch in the evening after the baby is in bed. We are able to keep our holidays low-key, what with a baby who is too young to know the difference (I'm going to enjoy this while it lasts) and a husband who usually works on holidays. Its nice. I get to pick and choose about how I want to celebrate. And yeah, the tree will be dried up by Christmas day, but I'm really enjoying it this year. Sad to say, but I think that my Christmas spirit is linked to the presence of snow (or lack there of). What can I say, growing up where white Christmases were the norm, I just can't shake it. Also, sickness has hit our house over the past few weeks and DS and I are still working through the last bit of our colds. Which totally saps my energy in the evenings when I should be doing things (and hopefully enjoying it). So yeah, it's been feeling "like a forced march through a list of things I have to do than like a celebration of peace, love, and all that. " here too. And add on to that my disappointment about the stuff that I'm crossing off my list that I was hoping to do. I swear next year I'm putting a note in my calendar (in October) saying START NOW! YOU WILL GET SICK AND LOSE AT LEAST TWO WEEKS!!! I schedule in all our Xmas stuff on our calendar, otherwise we end up filling our weekends with too much stuff and it ends up being more stressful. I do the outside decorations at our condo and was actually ahead of schedule this year. I think I put them up on Nov 30th. What's great is that our neighbours usually take the time to thank me for the decorations and that it's really nice to come home to (for me the whole reason for doing it), so it's nice that the work is appreciated. We got our tree on Dec 3rd as planned, but I was still sick as a dog. Body was aching in the car when we went to the market, but I thought it might cheer me up and also I knew that if we delayed that it would throw everything way behind. Did OK, we made a pretty quick selection which turned out to be great. But my patience was on a short fuse so I was losing it before we got home (and I felt more achey). Started putting on the lights the next day. It is such a pain doing it when you're not feeling well (or even when you are). Three strings of lights weren't working anymore, so lights were delayed for a week. I finally decorated with DS (3.5) and we had fun. I gave him all of the non-breakable ornaments to hang (a lot of nutcrackers) and like others have posted, they're all at the bottom. As DH says, it looks like a little army of nutcrackers. But it totally makes me smile. I filled out the tree with the breakable ornaments after DS' bedtime. And I must admit that once it was decorated it helped invigorate my Christmas spirit. It really is nice turning it on at night or in the am. I think our tree this year is at least 9' tall, maybe 10'. But we pick tall and skinny ones as we don't have a big place...just high ceilings in the living area. It must seem gigantic to DS. @SarcastiCarrie, YES! Centred! Please tell this to my DH. He wants to put it behind the sofa because when it's centred in front of the windows it ever-so-slightly gets in the way of his legs when he watches TV. @Zenmoo, On the extra tree: Oh, we have to do this for DS next year. We even have a box of DH's ornaments which are kinder toys that he's wired himself with hooks. DS kept taking ornaments off & on saying he wanted to 'fix' them. A tree he could re-decorate at his heart's content would be just his thing. Now for baking, and gift wrapping, and dinner preparation.... Some snow would be really helpful right about now. That's a giant (and lovely) tree! Ours is fake and while I miss the smell I just don't miss having to deal with stringing lights. On kids and ornaments, Tate was very into decorating the tree but for some reason wanted to hide his most favorite ornaments at the back of the tree in a cluster. Eh, shrug, the perfectly placed lights make any arrangement of ornaments look pretty at night. We went and saw our first Christmas play (The Christmas Story) together. That was a lot of fun. We had balcony seats and he made it through the whole thing. I'm not sure the gentleman to my left was as impressed with Tate as I was, he did end up in my lap for part of it, but I think we've started a tradition and I am really happy about that.